#NiharicaRaizada who was last seen at the Lakme Fashion Week 2018 sporting #JulieShah's collection was spotted at the launch of the boutique #LaDeeDaFashionHouse. Niharica at the launch said that she is someone who always looks for variety in couture and high fashion and La Dee Da will cater to all desires of a customer. Interacting with media Raizada said, "I am very happy to see the collection. It looks very beautiful. I am wearing one of their outfits and it is a peachish pink drape gown which can be draped in 7 ways. Its amazing and this is why I love wearing drape gowns. Their clothes remind me of fantasy princesses. They will really make you feel royal." 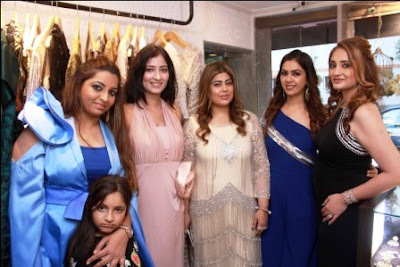 Pooja Dhanda and Neha Nagpal said the store will incorporate a variety of collections by fifteen designers all under one roof and will also features jewellery by Neha Lulla. Niharica last was busy shooting for a French Film and will mark her commercial debut in the Bollywood with Indra Kumar's 'Total Dhamaal.' alongside Anil Kapoor, Madhuri Dixit Nene, Ajay Devgan, Riteish Deshmukh, Arshad Warsi and more. Presented by Fox Star Studios, 'Total Dhamaal' is produced by Ajay Devgn Films, Ashok Thakeria, Markand Adhikari, Anand Pandit and Fox Star Studios. The film is scheduled to release in December 2018.